The Bryneer™ bulk salt storage and brinemaker is the first brining system that is completely designed and manufactured by a fiberglass reinforced plastic (FRP) fabricator. The Bryneer™, Plas-Tanks Industries’ own brine system, is the most efficient brine system available today. The Bryneer™ bulk salt storage and brine maker is the first brining system that is completely designed and manufactured by a fiberglass reinforced plastic (FRP) fabricator. With a single source for all brining components, you are offered economy and dependability. As a large fabricator of FRP vessels for a variety of applications, Plas-Tanks Industries, Inc., established in 1976, has the capability to customize systems to fit particular requirements for a given installation. Bryneer™ tanks are manufactured to the most current industry standards, including ASME RTP-1, using FDA approved resins conditioned to meet food grade sanitary guidelines. 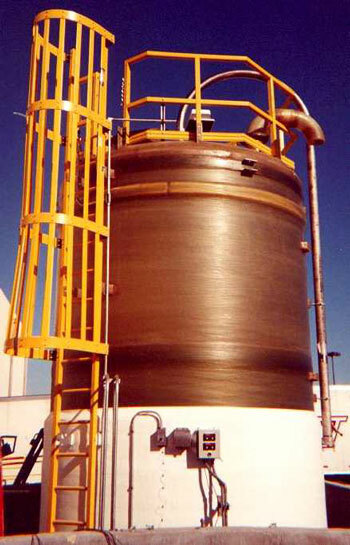 Plas-Tanks Industries is the only FRP brine tank fabricator to have an NSF 61 listing. An exclusive Two (2) Year Warranty and over 30 years of experience backs Plas-Tanks Industries’ ISO 9001 quality standards. The downflow brining principle ensures consistent brine saturation. As influent water rises, higher density brine sinks. Sludge from rock salt and solar salt is concentrated at the bottom of the Bryneer™, where it can be periodically removed. In many commercial brinemakers, inlet water is not distributed evenly. Eventually, this results in the formation of salt pillars in the tank, which can collapse and damage the vessel. This problem is eliminated in the Bryneer™ by the use of an induction header around the inside circumference of the tank. The ring is installed to spray water evenly around the base of the salt mass. A collector on the bottom of the tank collects brine evenly over the entire surface area of the vessel. It filters undissolved salt crystals and insolubles from effluent saturated brine. An outlet pipe draws brine from the collector through a nozzle in the vessel wall. When fine vacuum granulated salt is used, the collectors are covered with a filter bed to ensure that fine salt crystals do not pass through the collector. Replacement of such a filter bed should never be necessary due to the insignificant insolubles content of vacuum salt. A pneumatic loading and air venting system is designed for rapid loading, easy maintenance and minimum dust emissions. An abrasion resistant pipe is mounted for center fill using a long radius turn to minimize particle attrition and dust. The end of the fill pipe will adapt to a P/D truck hose connection. A connection on the pipe may be fitted with a water hose to inject water during truck unloading to wet the conveyed salt, resulting in minimized dust emission. Conveying air is exhausted through a vent at the top of the vessel. An extension mounted to the tank wall, with a salt dust bag at a serviceable height, facilitates cleaning. Should the bag become plugged during filling, there is pressure relief on the top to prevent tank damage. All of Plas-Tanks’ Bryneers™ are fitted with a side-mounted, leak-proof manway near the base for convenient clean out access. This port is used for periodic sludge clean outs, which are required when rock and solar salts are used. All collection and outlet internal piping is removable through the manway for cleaning or repair; however, removal of the internal piping is usually not necessary for a clean out. The Bryneer™ incorporates a unique brine level control system, to open and close a valve in the water inlet line. The digital level control is contained in a corrosion resistant, waterproof box. The unit comes complete with a digital display, revealing the brine solution level. The standard unit has contacts for high or low level alarms, and is capable of sending signals to a PLC (Programmable Logic Controller). The Salt Level Indicator is an optional feature on the Bryneer™. It is a way to measure and display salt levels. With the push of a button you will know your salt inventory, greatly reducing the chance of running out at a critical time in your production.